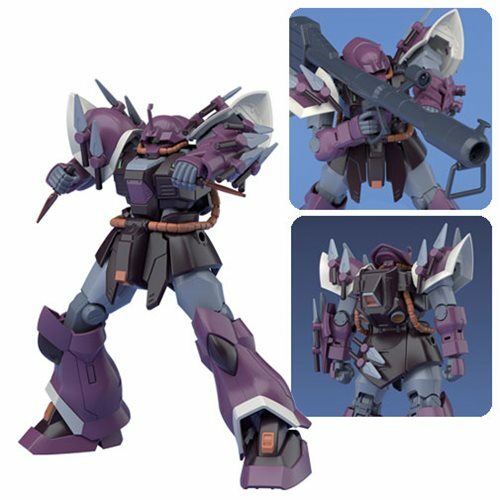 A mobile suit used by Zeon Remnants in episode 4 of Gundam Unicorn, here comes the Gundam Unicorn Efreet Schneid High Grade Universal Century 1:144 Scale Model Kit! The 14 Heat Darts equipped in various parts of the mobile suit are removable and can be used and posed in different ways to recreate scenes from the anime. The Efreet Schneid's Mono Eye is movable and the use of soft materials in the waist allows for a great range of motion! Set includes 14x Heat Darts, 2x hand-held heat darts, and Giant Bazooka. 9x Runner. 1x Sticker sheet. 1x Instruction manual. Measures 5-inches tall. Ages 15 and up.